Can you run a marathon? Maybe at one point in my life I could have, but not anymore. There’s no way! Well, what if I said that you could split up that distance and run it over a 30-day period? That’s less than a mile a day. Suddenly that doesn’t seem so bad. Hi there, education heroes! 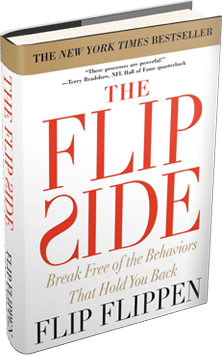 I’m Dr. Debbie Emery, leadership process executive at The Flippen Group, and today I want to share with you a talk by the senior program developer at the Drucker Institute, Lawrence Greenspun. In this talk, Lawrence shows us the big impact of little things and how those little things can influence others. Enjoy this talk, and I’ll be back in a few minutes! As a first-year teacher, Lawrence was about to start ‘Circle Time.’ One of his students asked to share two things instead of the customary one thing per person. She shared her pigtails, and also her penny loafers, which were just like Lawrence’s. Later that day at recess, this child sadly died in a tragic accident, and the coroner asked Lawrence to identify her. He was able to do so positively, because of her pigtails and penny loafers. By allowing the little thing of letting her share two items at circle time, he actually granted this girl her last wish. Another small lesson that made a big impression happened when Lawrence was a child, and his family took a summer vacation to the lake. Lawrence was being mean to his little sister. She got mad at him, grabbed one of his most valuable baseball cards, and destroyed it! Lawrence retaliated by slinging her into the wall. Then came the lesson. Lawrence’s mom took him out to the lake and asked him to throw a rock into the water. She then told him to look at the ripples. The rock didn’t just go into the water, but affected the other things around it. And when Lawrence was mean to his sister, it affected not only his sister, but also his mom, his dad, and many others. From that moment on, he realized that all of his decisions had ripple effects, both positive and negative. Well, I hope you enjoyed Lawrence’s talk on the bigness of little things. The stories remind me of how often we try to make big sweeping changes, like many people’s New Year’s resolutions. If we looked at ourselves and tried to make small changes, we’d see a greater impact. What’s something small you can change that will make a huge impact on your life? Let’s continue the conversation below. We’d love to hear from you.